The 2018 Toyota Yaris puts on a fresh face (or two) for the new model rollouts starting this summer. As part of the refreshing new design, Toyota has given the L and LE models a new front fascia, a brand new grille and bright chrome accents. The hood blends the body-coloured nose into the grille for a sharper appearance. The SE wears a different, sportier fascia filled with a black mesh grille. All models come with new bumpers and a lower bumper garnish on the backend to show off its width, and a set of wider taillights to ensure that followers see you when you stop. These wider taillights are integrated into the rear door. There is a sportier instrument panel added to the interior of even the low-end models, and they all get new steering wheels equipped with tilt. The new three-spoke wheels come equipped with built-in audio controls. All models have a sport analogue instrument panel that includes a speedo and tach, as well as the fuel gauge. The instrument panel contains an LCD display with trip meter, clock, outside temperature gauge and odometer. The fuel efficiency centre tells you your average fuel economy, how many more miles you can drive before your tank is empty and the average speed you are driving. There is an ECO-driving indicator on the automatic transmission models. You can still choose between a two-door and a four-door hatchback. The SE comes with accented 16-inch alloy wheels. The L and LE will both come with a tech bundle that includes USB ports, MP3 player, Bluetooth® and voice recognition with a 6.1-inch touchscreen. The SE will have its tech packages all upgraded and will include a 7-inch touchscreen. That package will include navigation, HD radio, HD traffic and satellite radio. All of the entertainment bundles include six speakers, iPod® connectivity and control and Siri® Eyes Free. Also included are previous safety systems like the Pre-collision Alert, Lane Departure Alert and Autonomous High Beams. The SE will have a backup camera. Toyota is offering the 2018 Yaris in an array of colours, as well as a two-tone colour option this year: Blue Eclipse with Black Sand Pearl Roof. Even though there are some cosmetic updates to the 2018 Yaris doesn’t mean that the 2017 model is not a good-looking subcompact car that will go anywhere with you. 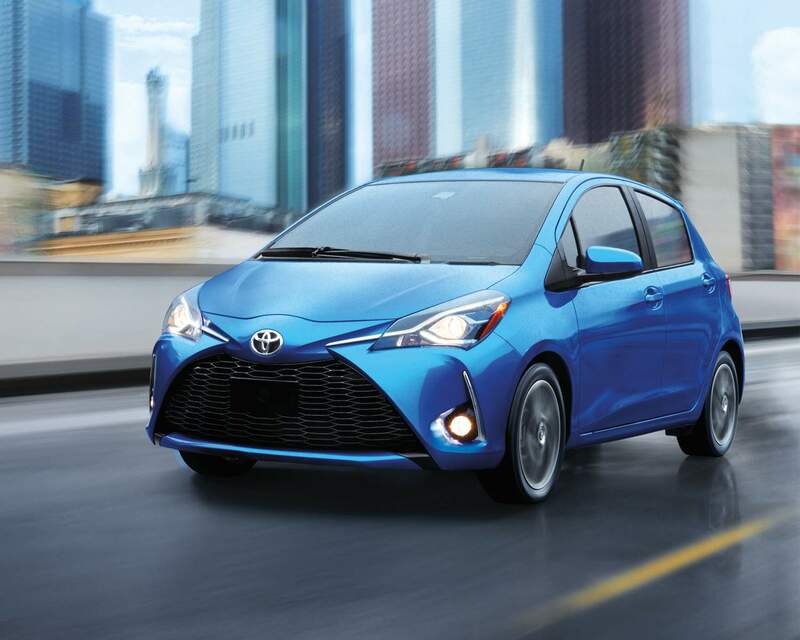 In fact, the 2017 Yaris sedan and hatchback are both filled with technology and features that make this little car both fun and economical to drive. If you need a car that you can zip around the city in and is easy to park, the Yaris is perfectly suited to your lifestyle. Even though it has a short wheelbase, which makes it easy to turn and easier to park, it still offers you a lot of interior room for grocery shopping and picking up the kids from school. Plus, it’s peppy enough to hit the highways and cover some distance quickly. Both years are filled with money saving options that make purchasing a Yaris a great way to save money. The 2017 hatchback gets 7.8 in the city and 6.5 on the highways L/100km, so you spend less at the pump, too. Summer is here, and it’s time to look for a car that will make summer driving fun. The 2018 Toyota Yaris or the 2017 Toyota Yaris both add fun to your summer. Come by and see us today. We’re ready to take you on a test drive.